Volunteer for the Brain Awareness Campaign! 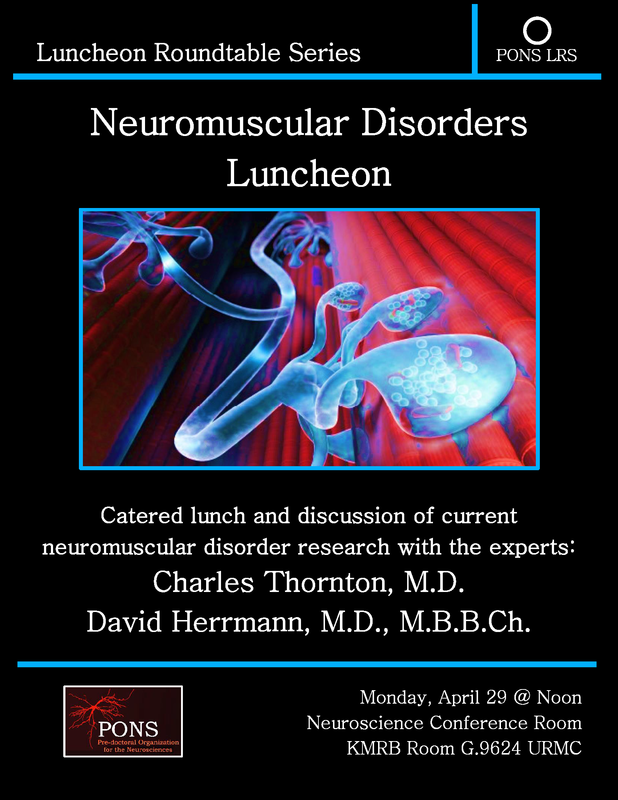 Please join us to discuss current neuromuscular disorder research with expert panelists Drs. Charles Thornton, M.D. (Dept. of Neurology ) and David Herrmann, M.D., M.B.B.Ch. (Dept. of Neurology). Refreshments will be provided. See you there! 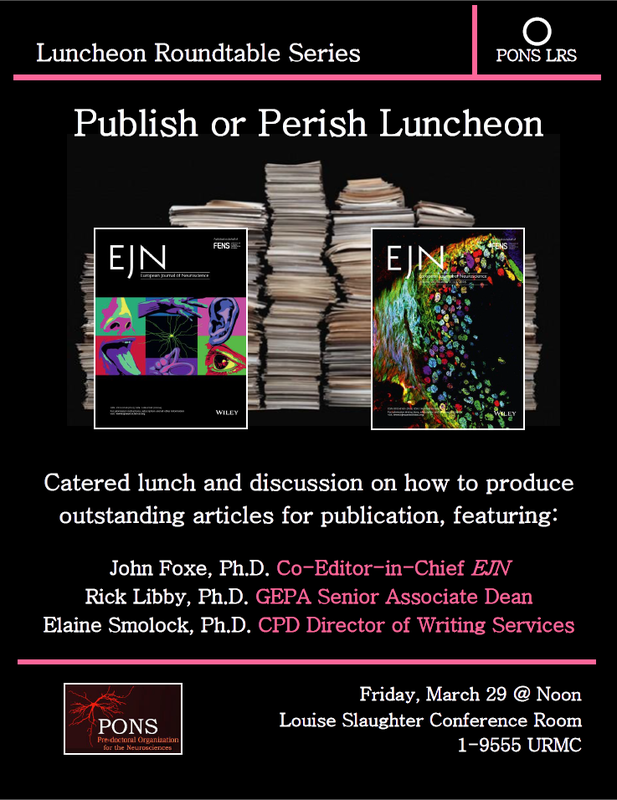 Our Publish or Perish event will be held at noon on Friday, March 29 in the Louise Slaughter Conference Room (URMC 1-9555). Please join us to discuss how to produce outstanding articles with expert panelists Drs. John Foxe, PhD (Dept. of Neuroscience & European Journal of Neuroscience Co-Editor-in-Chief), Rick Libby, PhD (Dept. of Ophthalmology & GEPA Senior Associate Dean), and Elaine Smolock, PhD (Dept. of Microbiology and Immunology & CPD Director of Writing Services). Refreshments will be provided. See you there! 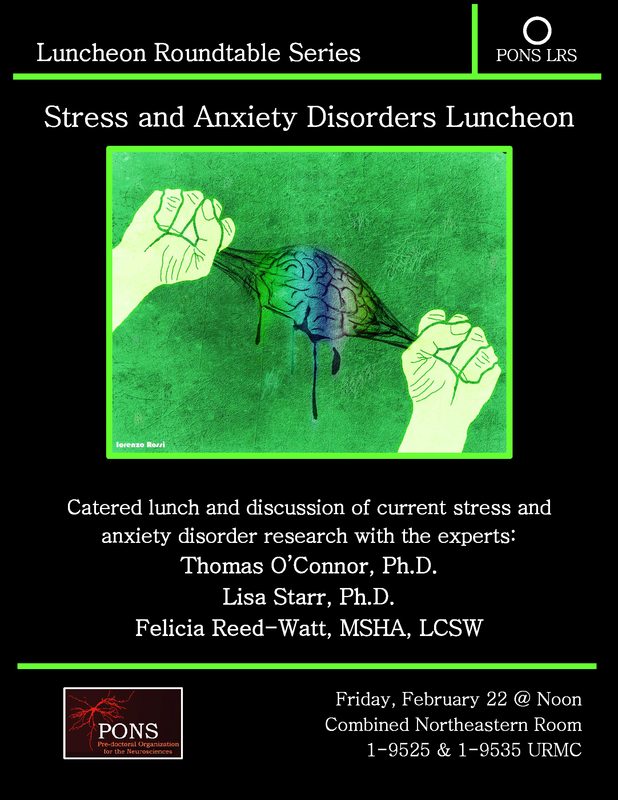 Please join us to discuss current stress and anxiety disorder research at the U of R with expert panelists Drs. Lisa Starr, PhD, (Dept. of Psychology), Thomas O’Connor, PhD, (Dept. of Psychiatry) and psychotherapist Felicia Reed-Watt, MSHA, LCSW (University Health Services). Refreshments will be provided. See you there! Hello, fellow lovers of brain science! The University of Rochester Brain Awareness Campaign would like to invite you to attend the third annual Rochester Brain Bee! The Brain Bee is an informal brain trivia competition where high school students compete for the title of Brain Bee Champion. The winner will receive travel funds to the National Brain Bee in Hershey, PA. The Rochester Brain Bee will take place on Saturday, February 2, from 1-4 PM in Sloan Auditorium (Goergen Hall room 101). Light refreshments will be provided. If you have any questions, please contact RochesterBrainBee@gmail.com. The Rochester Chapter of the Society for Neuroscience is hosting a Poster Session and Happy Hour with prizes for the best posters. Students and Postdoctoral fellows may register any poster that you have presented in the past year (SfN Meeting, VSS, IMRF, ARO or other recent meetings). Tuesday, November 27: Brain Awareness Campaign Fundraiser at Chipotle! The University of Rochester Brain Awareness Campaign is gearing up for our third annual Brain Bee! This competition for local high school students takes place every February, and we send the winner and their parent to Baltimore for the national competition. In order to do this, we need your help! We are hosting a fundraiser at Chipotle on Tuesday, November 27 from 4-8PM. If you are hungry, please stop by the College Town Chipotle and mention that you would like to support the Brain Awareness Campaign. That’s all it takes! Burritos for you, money for us to send a student to a national neuroscience competition. If you have any questions, please feel free to email us at URBrainAwareness@gmail.com. 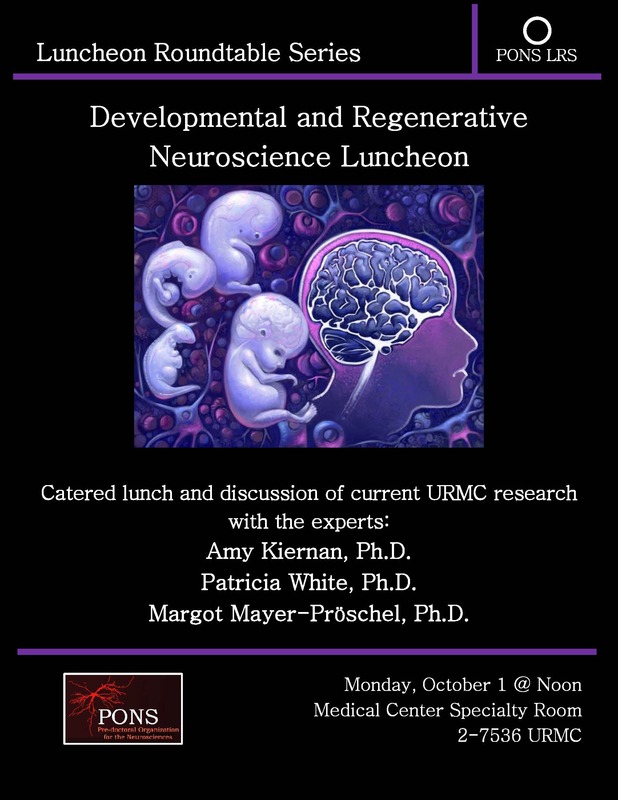 Please join us to discuss current developmental and regenerative neuroscience research at the U of R with expert panelists Drs. Amy Kiernan, PhD, (Dept. of Opthalmology and Biomedical Genetics), Patricia White, PhD (Dept. of Neuroscience), and Margot Mayer-Pröschel, PhD (Dept. of Biomedical Genetics). Refreshments will be provided. See you there! 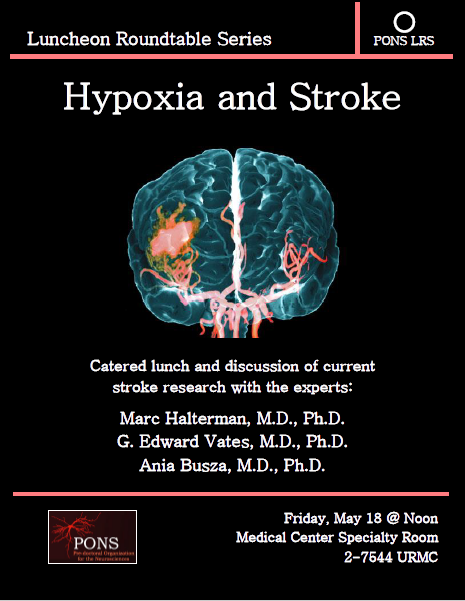 Please join us to discuss current stroke research at the U of R with expert panelists Drs. Marc Halterman, MD/PhD (Dept. of Neurology), G. Edward Vates, MD/PhD (Dept. of Neurosurgery), and Ania Busza, MD/PhD (Dept. of Neurology). Refreshments will be provided. See you there! 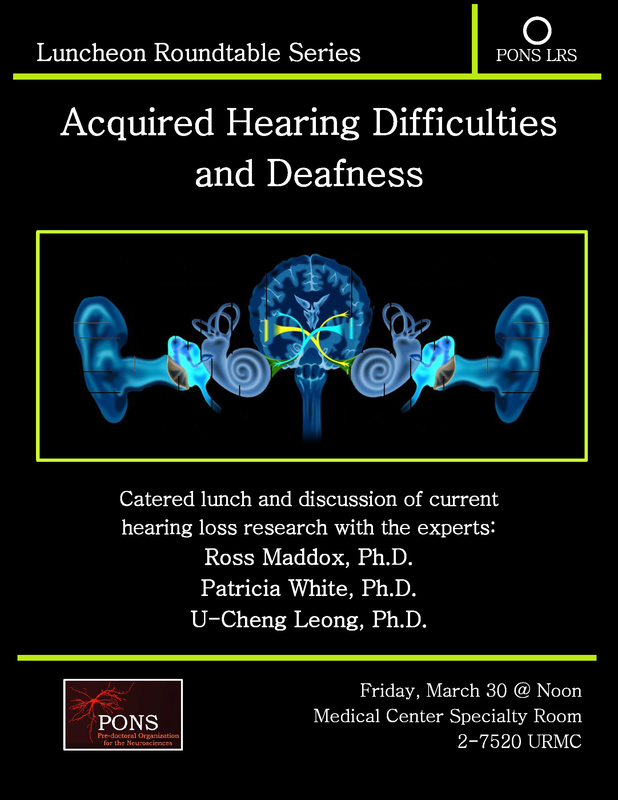 Please join us to discuss ongoing hearing loss research at the U of R with expert panelists Drs. Ross Maddox, Patricia White (Dept. of Neuroscience), and U-Cheng Leong (Dept. of Audiology). Refreshments will be provided. See you there!